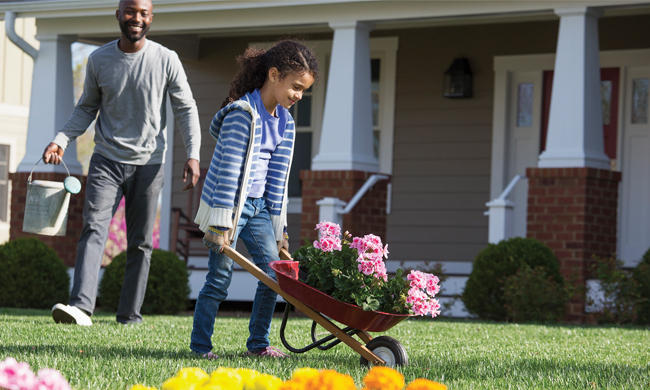 (Family Features) Growing a healthy, appealing lawn isn’t about doing one thing right; it’s about doing a combination of things right. Different aspects of lawn maintenance, whether it’s watering, fertilizing or mowing, are interrelated. If you complete one task incorrectly – or skip it entirely – you may increase problems with insects, diseases, and weeds. Different grasses grow in different areas of the country. Warm-season grasses, including bahiagrass, Bermuda grass, St. Augustine grass and zoysia, usually grow in warmer, more southerly regions. Cool-season grasses are typically grown in cooler, more northerly regions and include fescues, Kentucky bluegrass, and ryegrass. Check with your local Cooperative Extension office to learn which types of grass grow best in your area. Start by cutting with a sharp mower blade that cuts grass cleanly, without tearing or shredding. Proper mowing height depends on grass type and time of year. Mow when the grass reaches one-third higher than the recommended mowing height. Set your mower at the upper end of the recommended height range during the hottest time of the year to encourage deeper roots. Vary your mowing pattern to avoid creating ruts in the lawn. Avoid mowing when the soil is wet or you can risk tearing up grass and soil. Leave grass clippings on the lawn to contribute organic matter to the soil and reduce fertilizer needs. Be on the lookout for insects. Some of the signs of problems to look for are animals like skunks or raccoons digging up lawn areas or flocks of birds feeding on turf. This could be a sign of white grubs, a common lawn pest, requiring different methods of control depending on the time of year.